Convert among all popular HD video formats, like HD TS, HD MTS, HD M2TS, HD MKV, HD MPEG, HD AVI, HD WMV, HD MPG, HD MP4, HD MOV, HD ASF, HD MOD, etc. 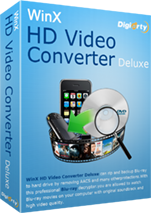 WinX HD Video Converter is the most trusted HD (High Definition) video converter software which can convert among all popular HD video formats, like HD TS, HD MTS, HD M2TS, HD MKV, HD MPEG, HD AVI, HD WMV, HD MPG, HD MP4, HD MOV, HD ASF, HD MOD, etc. Besides, it supports to convert HD videos to SD videos and audios, Here SD videos include AVI, MP4, MOV, WMV, etc. With intuitive interface, WinX HD Video Converter brings you the most comfortable video converting experience. In only a few clicks, you can enjoy the fun of converting HD videos mutually, converting HD videos to SD videos, and converting SD videos to HD videos according to your own needs. Apart from this, this program provides you some additional features, for example, defining the video/audio parameters to optimize output video/audio quality as you wish. Our goal is to make HD video conversion an easy, fast and stable experience beyond your expectations. Fully compatible with all popular HD video formats. Supports HD videos mutual conversion and SD videos to HD videos conversion. Moreover, HD videos to SD videos conversion can be also achieved by lowering the video resolution. It lets you fully control the video & audio parameters like resolution, bitrate, and frame rate, etc, to get the best video & audio quality as you wish. The "Trim" function can help you cut any clip from the original video by dragging the slide bar to the accurate position or by setting the "Start Time" and "End Time" of the clip you want to get. WinX HD Video Converter supports batch conversion, which allows you to convert multiple files at the one time while quality is great and speed is fast. Multi-core CPU supported, which speeds up video conversion notably - New! Lets you batch rename video clips with "Renaming Template" before converting - New! All product of Brand Digiarty Software, Inc. Convert Video to Portable/Console Player. Create video presentations using PowerPoint files, capture PC screen in HD, and use two webcams simultaneously to create compelling podcasts and training videos. TotalMedia HDCam is the perfect companion for your video camera.